I love reading as you may already know and have only recently switched from physical books to an e-reader. I was debating for over a year as I love the smell and feel of books in my hands as well as building my stash for my future grand library. However, that desire was quickly dispelled as I read my first book on the e-reader. It is so much more convenient when rocking a tot to sleep at night as well as when lounging by the pool. I also like it when traveling because it weights virtually nothing and takes up little space in my carry-on. The HD Kobo Aura H20 is the perfect holiday gift. 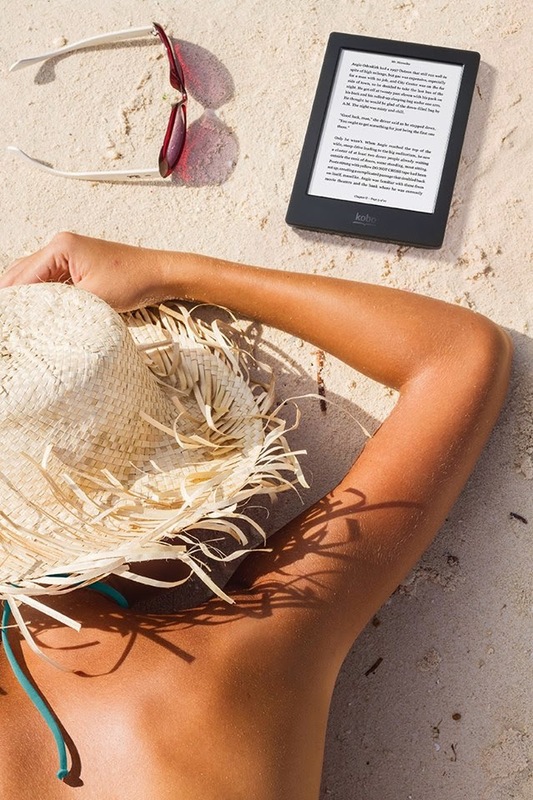 You can really read anywhere with this handy e-reader due to it being waterproof and dustproof. It's 6.8 inches in size and has customizable fonts, ample storage and reading stats. Gone Girl - Definitely a must read. It was a little slow going in the beginning (since I kept on getting distracted) but you will be intrigued. The Fault in Our Stars - Heartwarming and tears will form as you read through this book. I'm the type to see the characters as I read and I think I will start balling when I see the movie. Insurgent, Allegiant, Divergent - The trio of books that will keep you on suspense and want to keep reading through the night. I will admit that I have fallen asleep reading these books only to awaken and find my e-reader under my pillow. I love reading books before watching the movie that corresponds. Do you? Donna Tartt’s, The Goldfinch was the most downloaded and least completed novel of 2014. While the novel was critically acclaimed, it is likely the length of the novel (at a whopping 784 pages in the print edition) that proved daunting for some. I am really excited about starting the new year with this book. The plot looks interesting and I am a sucker for long books. I also have The Rosie Project and The Husband's Secret in my cart to read next. They are both a wee bit different than my usual selections but I like finding gems through Best Seller Lists. Two other selections round out the 2014 Best Seller List: Written in My Own Heart's Blood and Philomena. I gravitate more toward fiction but the non-fiction true story line of Philomena draws to me. While I am a fan of historical TV shows and sometimes movies, reading books in this genre are a bit difficult for me. Yeah, I wasn't that great in history or constitutional law in school. So if you have any tips for me, I am all ears! Did you read any of the books on the 2014 Best Seller List? What are your must reads for the New Year? Fabulous post! Loved the husbands secret! On the top of my list: The Fault in Our Stars. Awesome giveaway! Gone Girl was an excellent read thrilling, suspenseful & exhilarating! I would like to read Divergent I saw the film but I wish I read the book. I am a University student and I love to read. However books are expensive. Good luck to everyone!! !